The Fred Hollows Foundation is working in Ethiopia to eliminate trachoma, the leading infectious cause of blindness in the world today. In Ethiopia alone, there are over 76 million people who are at risk of contracting the disease. In 2018, The Fred Hollows Foundation has been implementing the World Health Organisation’s SAFE strategy in the Oromia region of Ethiopia, to ensure the disease is simultaneously eradicated and prevented from reoccurring. This strategy focuses on surgery, antibiotics, facial cleanliness (behavioral changes) and environmental improvements. 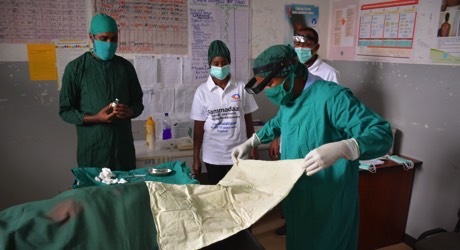 Between January to September in 2018, 19 lid surgeons were trained, over 45,000 trachoma trichiasis surgeries were performed and 22,714 community health workers, teachers, and health personnel were trained in trachoma elimination. Significantly, during this time over 19 million doses of antibiotics were distributed. Distribute 3,446 doses of antibiotics to combat trachoma. 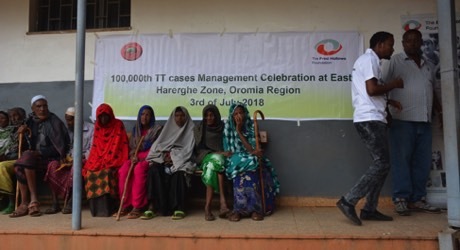 On Tuesday 3 July 2018, The Fred Hollows Foundation, in partnership with the Government of Ethiopia and the Oromia Regional Health Bureau, celebrated its 100,000th trachoma trichiasis surgery since the start of the program in Ethiopia. The 100,000th surgery was performed on an 80-year-old woman, Ke-meru Abdela, in the East Hararghe Zone of Oromia. “When The Fred Hollows Foundation started work in Oromia about four years ago there were 150,000 people desperately waiting for surgery. We have made massive inroads into the problem and will continue our efforts to ensure everyone who needs surgery gets it and that together we eliminate trachoma in Ethiopia.”. The Fred Hollows Foundation has joined with strategic global partners, such as Sightsavers, and with global bodies, including the World Health Organisation, to see trachoma eliminated in the places where we work by the year 2020. Significant progress has been made in Ethiopia through the efforts of The Fred Hollows Foundation and its partners. The Foundation’s current Trachoma Elimination Project runs from 2018 until 2020, at which time analysis will occur to determine the status of trachoma in Ethiopia. The Fred Hollows Foundation is also starting to address other eye health conditions, such as cataracts, and will continue to work in Ethiopia until avoidable blindness has been eliminated. Can I Visit the Project? Interested donors should contact The Foundation. In Ethiopia alone, there are over 76 million people who are at risk of contracting a blinding eye disease called trachoma. Trachoma is the leading infectious cause of blindness in the world today. It is a chronic inflammation of the eye lining and eyelids, which become rough and scarred if left untreated. As trachoma advances, it can lead to permanent and irreversible blindness. Trachoma is a disease of poverty. It thrives in hot, dusty and overcrowded environments. Trachoma spreads from person to person through unwashed hands, shared face-wiping cloths, and by flies that have been in contact with the discharge from the eyes or nose of an infected person. Communities without adequate infrastructure and basic services, such as running water, are also prone to trachoma. 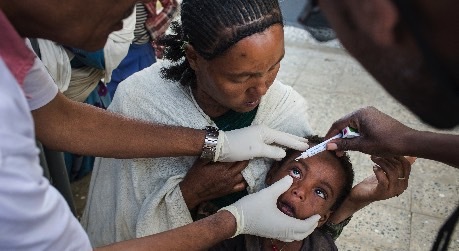 Further, women and children represent 75% of those suffering from trachoma in Ethiopia. In its initial stages, trachoma can be treated with a simple dose of antibiotics. 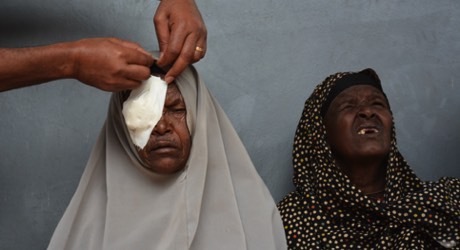 The Fred Hollows Foundation is working to address this eye health crisis in Ethiopia by performing surgeries, distributing antibiotics, educating communities about hygiene and sanitation, and investing in infrastructure such as running water and working toilets. The Fred Hollows Foundation’s Trachoma Elimination Project in Ethiopia is a large scale project across the region of Oromia to implement the World Health Organisation’s SAFE Strategy (surgery, antibiotics, facial cleanliness, and environmental improvements). 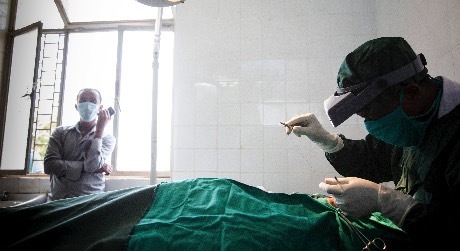 The Foundation is addressing the acute shortage of eye health professionals in the country by training eye surgeons and nurses who can perform surgery on patients with advanced trachoma. These teams are then conducting outreach screening and surgery, ensuring people in remote areas are able to access services. Further, the development of strong sanitation and hygiene practices, and improving access to clean water and working toilets, will reduce the spread of trachoma in these communities. The Fred Hollows Foundation always works in partnership with like-minded organisations and health providers to ensure the greatest reach and biggest impact of our sight restoring work. Where possible, we work with governments to better implement eye health systems and train local doctors, nurses and health workers to help their communities. In Ethiopia, The Foundation is working in collaboration with The Oromia Health Bureau to implement this project. Elimination of Trachoma by 2020 (GET2020) to mobilise resources and foster cooperation within a worldwide partnership of Member States, nongovernmental organisations and the private sector. The Alliance is the principal platform through which the trachoma community works to deliver WHO’s recommended SAFE strategy. The Fred Hollows Foundation is proud to work in partnership with strategic global partners, such as Sightsavers, and with global bodies such as the World Health Organisation and the International Coalition for Trachoma Control to contribute towards this 2020 deadline. This project in Ethiopia forms part of that approach. How was it this funded? Thanks to hundreds of tiny donations from these online businesses and their customers. The Fred Hollows Foundation is an international development organisation working towards eliminating avoidable blindness and improving Indigenous Australian health. We are inspired by Professor Fred Hollows, a humanitarian, eye surgeon and social activist. Established in 1992, The Foundation continues in Fred’s footsteps and now works in more than 25 countries around the world and here in Australia. Working with in-country partners, we perform surgeries, deliver local training, provide equipment, educate about eye health and advocate for change. Footprints Fundraising Inc. (NSW) #INC9884228. Level 21, 680 George St, Sydney 2000 Australia, © 2005 - 2019 All rights reserved.